These are some of my first cousins. Our mothers were sisters. 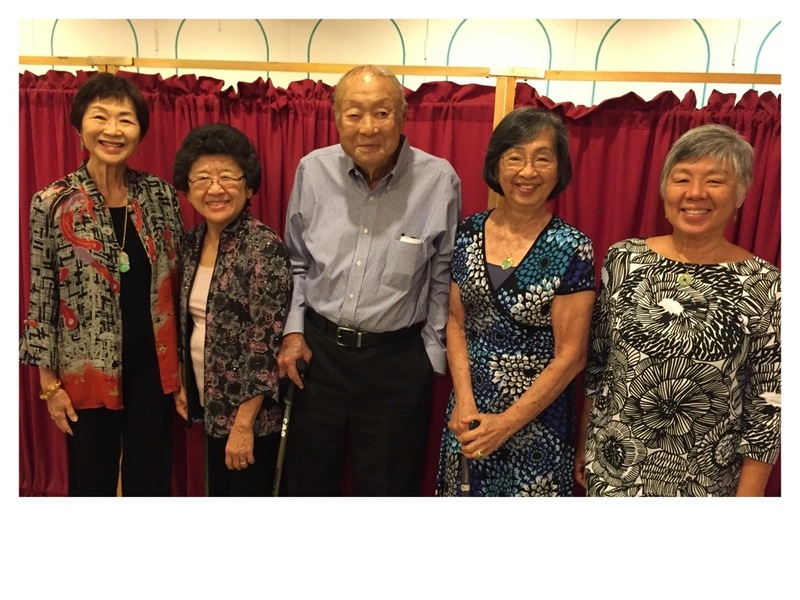 Cousin Millie organized a table for 10 at last night’s Tsung Tsin Association dinner in Honolulu. About 120 people attended. The club perpetuates Hakka Chinese culture. 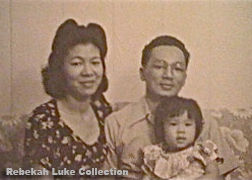 Though of Hakka origins, my cousins and I live as third generation Americans in Hawaii and don’t speak Hakka, though our Tsya Po (grandmother) did. The annual event helps to remind us of our roots. Pictured below, from left: Millie Lui, Audry Helen Kim, Kwong Yen Lum, Eileen Lovelace, and me—Rebekah Luke. Photo by Marty Watts. I am an only child, and actually an orphan, as my friend reminded me when my parents died (ha! ), yet I have a family. More than one! I made this photo of my immediate family, sans pets, this past October. I consider my immediate family, now, as me, my darling husband (DH), his daughter who is now married and has her own family including Miss Marvelous; and we can’t forget Alice Brown and Ula. Socially our family name is Krape, though daughter didn’t hesitate to change hers to Hylton. As I write this, all of us are expecting the birth of Miss Marvelous’s new sister, any day, any minute! My first immediate family. Me, my momma, my daddy. Here we are, I as a toddler. 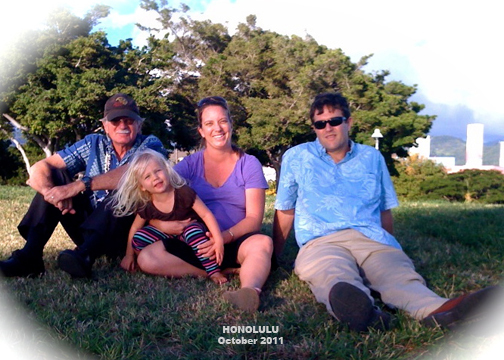 My hanai family the Sinclairs. Around the time I finished high school and when my parents divorced, when I was not quite mature enough nor emotionally equipped to be on my own, a wonderful kamaaina family with father, mother, and six children accepted me into their home to live. The eldest daughter Margaret was my best friend at Punahou. Sunday family dinners at The Sinclairs’ are legendary. I was given the honor of delivering Doc Sinclair’s eulogy. Mom Ivalee is in her mid-80s, still works (! ), and today she is having Thanksgiving dinner at her house as always, with David, Ruth, Karl, Brian, me and our families or partial families present. I’m baking and bringing the rolls. By the way, Doc Sinclair did deliver Barack Obama. My Chong cousins. 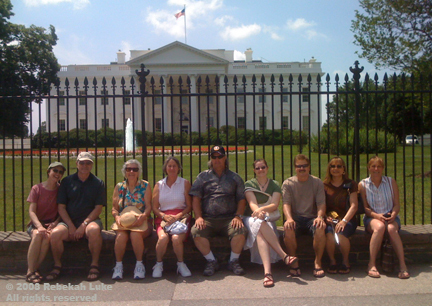 These are my relatives on my mother Fo-Tsin’s side. 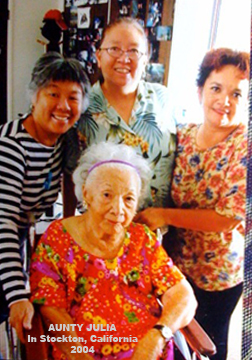 She was the youngest of 15 children who all were born and grew up in North Kohala. Most of my cousins are still on Oahu. Some are overseas in North America, one is in Asia, and another is in Australia. We’re having a family reunion next year, with a revisit to our ancestral homeland getting top billing. It’s really fun to plan this event, and I hope many of my cousins will turn out for it. The mailing labels number 85 families, but I should have more! I love helping to plan our reunions, though this might be the last one for which I’m the point person. Isn't this a funny image? 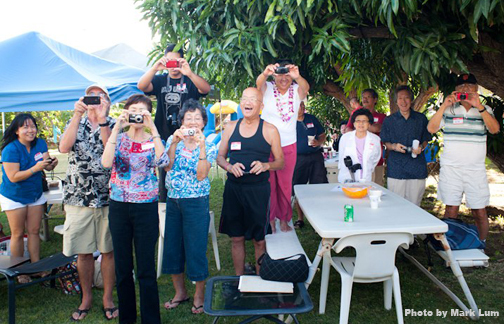 Mark Lum, my first cousin once removed, made this photo of the Third Generation Chongs photographing the Fourth Generation at a family gathering this summer. I'm in the red pants, vertically challenged as usual. My Luke cousins. Ah, my dad Arthur’s side, the Hawaiian-Chinese side. This is a good-sized family as well; Dad was one of 13. By their nature the Lukes did not/do not stay in touch like the Chongs. They moved all over, often divorced and remarried. Some were loners. After my father died in 2003, I made it a point to visit my Aunty Julia in Stockton, California, who was Dad’s eldest sister and last-living sibling living with her daughter Loris Ann. The occasion brought my girl cousins together. It was great to see Laureen, Lorene, and Loris Ann in California, and Bee in Colorado, share stories and meet their spouses and children. One time before that, to add to the research of my genealogy, I phoned them to re-introduce myself as Uncle Arthur’s daughter and quizzed them about how many more relatives I had. For Christmas I sent them the family tree as a gift. I am so glad I met them again as an adult, in person. I feel blessed to have these relationships and so many more. I am thankful, for you, too, dear reader! We are One. Happy Thanksgiving, everybody! I love you. P.S. Oh, I haven’t forgotten my in-laws: DH’s brother-sister-aunts-cousins. That’s another clan. Count me among the growing number of so-called older Facebook fans reported on in the broadcast and print press this week. I’ve been persuaded by my younger and smarter friends and family members to hop aboard, presumably to promote my work and stay connected. In a few short weeks, Facebook did that and more for me. It is definitely social, like being at a party. It’s a great medium for keeping abreast of what the younger folks (and now older folks) are doing and thinking. As a networking tool, its extent is far reaching, and the type of information exchanged is surprising and intimate. If you’re beginning to feel a little behind the times, just take a leap of faith and get on FB. You’ll be up to date in no time. One of my initial objectives was to keep up with my younger relatives. I asked Miss Marvelous’s mom to tutor me in Facebook. Then with a curious interest I “friended” my first cousins, and my first cousins once- and twice-removed online. And I’m not speaking of email. The medium of FB itself is friendly and as private as you wish, with encouragement to not just connect, but to interact too. How well one can build and maintain a fan and fund base if you are a professional entertainer or filmmaker, as my cousins Sunway and Titus do day and night. Many of my FB friends appreciate fine food, posting photos and details of their most recent culinary adventure. Could be we’re friends because of our similar tastes! My cousins on FB were the subjects of “The Cousins,” a collection of fresh stick figure drawings by cousin Toy. I scored an adorable caricature of “Artist Cousin” for my profile photo on my fan page. I think Toy, encouraged by the positive feedback from her relatives online, might pursue her art further. FB is immediate, so you can get the news headlines before the paper publishes it tomorrow morning. The words and images some people choose to share are fill in the blank . For many people FB is the communications medium of choice or necessity. I re-connected with a young friend now a medic deployed to Afghanistan, and I was alerted via FB’s chat feature by my hanai sister who didn’t have my phone number handy that she fell with her horse and was in the hospital. Facebook is immediate and in real time. Not wanting to wait for the next big family reunion of the sort that takes months of planning, I wanted to get to know my younger cousins who already formed a network on FB. They comment on anything and everything and with everyone. I thought, too, it might be nice for them to get to know each other in a different venue. What kind of experience would it be to have them meet and converse in person? Surprisingly to me, while the conversations on FB are very chummy, Sunday’s “Cousins Gathering in the Country” was the first time several of the cousins met each other face to face! With three generations of adult cousins present, we oldsters realize it’s time to tell the “kids” who’s who in our genealogy. I brought out the silver gelatin prints that our late cousin Anson made in the 1950s (I inherited them from his widow Ann), and invited my cousins to have the images that had meaning for them. At the end of the evening most of the photos were on their way to new scrapbook albums. Some have already been posted to FB by cousin Tim, I see, and tagged (identified). Imagine having a photo of your great-great-grandmother for the first time! Cousin Titus brought the short film “Lychee Thieves” (written & directed by Kathleen Man), that he co-produced, about the cast of characters’ individual desires for lychee from a certain tree and the conflicts that ensue. We all concurred, well done! We talked, ate potluck, cracked jokes, just got to know each other a little better, and everyone went home with some of this season’s three-pound avocados that they watched us pick. It was fun! Facebook remains a most intriguing social media. I find it enhances the times when you can still pick up the phone to hear your friend’s voice or meet and see your friend in person. My teacher AliceAnne Parker said the internet is just practice for what we all will be able to do eventually with our psychic ability. As the Light grid around our planet becomes stronger we will just know. Everything. I wonder if eventually is now. I wonder if Facebook is a means to understanding Oneness. We are One.